All home / property owners have one thing in common. How to keep their roof drainage system working properly. When gutters are backed up with leaves and debris, rain and melting snow can cause serious water damage. Preventative maintenance (by way of cleaning your gutters & downspouts) is the least expensive and most cost effective way to prevent any damage! Gutter Guzzler and its unique vacuum cleaning system, developed in the late 90s by owner operator, Rick Roberts. The idea was driven from the need to provide home / property owners with an alternative to traditional methods of cleaning their roof gutters. 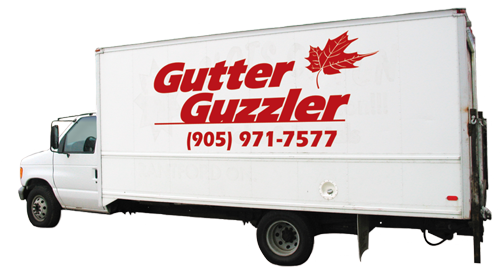 Gutter Guzzler takes pride knowing we were the first to provide this type of service. For more than a decade in business, we have become the preferred service provider for your roofs drainage system maintenance needs. From atop your roof with a long extension hose debris is sucked from your roof gutters, it goes down the hose and back to the service truck for recycling. The job is done. If cleaning no longer meets your preventative maintenance needs, ask about our 4 step program to forever free flowing roof gutters. Gutter Guzzler's 4 step program puts home / property owners in their comfort zone year after year. Maintaining your roof drainage system is a necessary but dangerous job and should be left to the Professionals.